The QHW The Vinyl arrives at the TNT-audio UK mountaintop lair soon after two phono pre-amplifiers separated in price by an order of magnitude. Nestling at a price point about halfway between the Tisbury Audio Domino and that supremely versatile Gold Note PH10 the QHW The Vinyl will either have to offer a different USP (unique selling point) or sound quality above its market position. Those spelendid folks at QHW were prepared to risk the unvarnished opinions of two reviewers from the most trusted source of audio information on the internet. Read Richard Varey's comprehensive technical description and review, if you haven't already as there'll be no repetition. Much was made in our discussion of the Gold Note PH-10 of the monumental challenge of raising that puny cartridge output voltage to line level. It is a task as grandiose as that of generating a signal from vinyl grooves in the first place. Remarkable for its price, each production unit of The Vinyl is tested for a considerable period of time, not only bench tests but also reproducing music with a real world cartridge and music LP. This thoroughness pays off as the QHW The Vinyl sounded good straight from the box and I was in no hurry to return to either the Gold Note PH-10 or my reference, the as yet unsurpassed Canor TP306 VR+ with Grant Fidelity Shuguang Treasure Series 6SL7 input valves. In comparison with the Gold Note PH-10, the box fresh QHW The Vinyl was slightly less transparent but with slightly firmer bass and a slightly more solid soundstage built on that bass. Extended listening confirmed these initial impressions, with the considerably more expensive Gold Note offering clearer insight and retrieving finer details and nuances of performance, while The Vinyl seemed to extract more joie de vivre and maintain better PRaT. So close is the performance of these two approaches to vinyl LP replay, that whichever was plugged in at the time gave equal pleasure and no incentive to swap. Then your Old Scribe disconnected the dedicated audio mains supply and made the annual pilgrimige to the WOMAD festival. On returning and attempting to fire up the system to listen to the various slabs of vinyl purchased at the festival (including the festival purchased remaster of Leftfield Leftism) there was not a peep from the QHW The Vinyl. An exchange of emails with Francisco J Vizcaya López of QHW resulted in a complete replacement unit being sent. This worked perfectly again straight out of the box and was hooked up simultaneously with the Kerr Acoustic K320 2 way floorstanding transmission line loudspeakers. Immediately it was apparent we'd missed something, and sure enough, your Old Scribe had failed to set the correct loading for the Benz Micro cartridge in use that day. Once all was in place the tunes began to flow and the Kerr team of Jes and his Dad felt the Kerr K320 were sounding just as they should. With deep extended but resonance free bass, which was exactly as we heard them via the QHW The Vinyl phono pre-amplifier. Returning to the thorny issue of why one unit failed, one hypothesis your Old Scribe offered was that UK voltage (being originally specified as a 240V supply, has harmonised with the original 220V suply of the rest of Western Europe by simply redefining the supply tolerance envelopes (230V AC +10% to -6%) of both systems. However, the QHW outboard power supply is specified to work from 95V to 265V which should cover most eventualities, especially as the dedicated audio ring circuit is protected by 3 way surge protection. 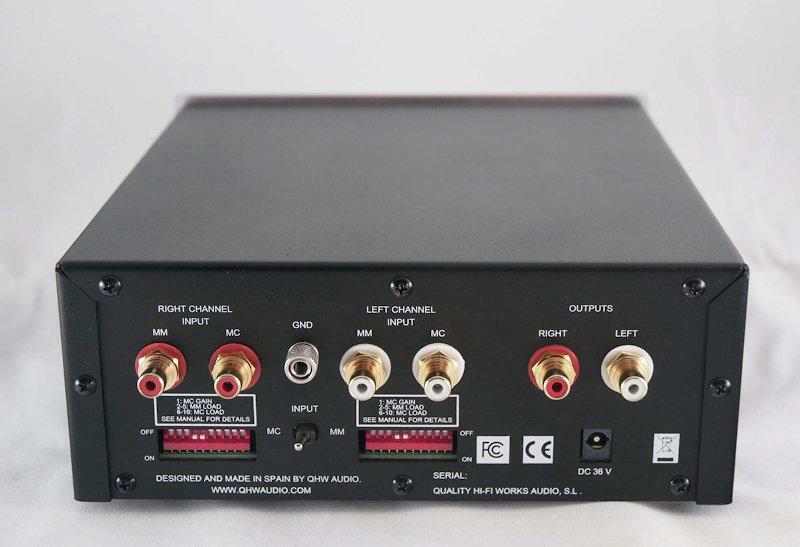 It can be inferred from the excellent bass quality of the QHW The Vinyl and fine PRaT that the power supply is fit for audio purpose and that some other issue was involved that the company were very quck to rectify and seemed genuinely surprised and concerned. The tunes keep on coming and while neither the Gold Note PH10 nor the QHW The Vinyl are in the same league for transparency, soundstage scale and solidity, frequency extremes, lucidity and musical flow as the more than twice as expensive Canor TP306 VR+, they are comparable with each other but different in their performance. The Gold Note offers unusual equalisation flexibility for heritage recordings and slightly greater transparency. The QHW The Vinyl offers a slightly greater range of moving magnet cartridge loading options and more Flat Earth appeal. Both of these mid market (only a few years ago a standalone phono pre-amplifier costing a grand would have been madly extravagent) specialist LP phono pre-amplifiers are in the foothills of high end territory for performance, outperforming many of those better advertised rivals that get the Best Buy or Highly Reccommended tickets in the advertising driven pages. Both the QHW The Vinyl and the Gold Note PH-10 are a big step up from entry level products and neither disappoint. Both remained in the reference system while judging cartridges and loudspeakers, without reservation. It is only when inserting a much more expensive, tweaked and optimised product like the Shuguang Treasure Series 6SL7 revalved Canor TP306 VR+ that it becomes obvious that more may be possible at a higher price. The only way potential buyers can be sure that either is the right one for them is to listen to them in their own system or consider how well their priorities fit those of the designers. The QHW The Vinyl is a highly competent and well executed design at under 1k€.